Quick and Healthy Solutions for a One Dish Meal! Stir Fry is a very healthy and cheap way to eat. The majority of a stir fry dish is vegetable, with a small amount of meat and oil. Stir frying can use many different types of vegetables, meats and can be flavored with many different spices and sauces. The most common ingredients in stir fry are bell pepper, carrot, mushroom, onion, and a protein of chicken. 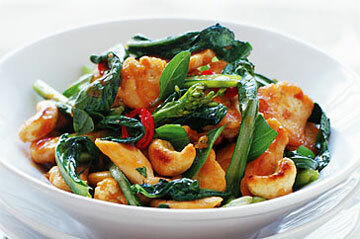 To kick up a more standard stir fry tofu or cashews can be added. For sauce, a mixture can be made, or a bottled stir fry sauce or seasoning packet can be used. Brown meat first, remove from pan, cook vegetable, add meat back into vegetable dish, then add sauce. Season oil, if desired, prior to stir frying meat and vegetables. This can be done easily by adding a little minced garlic and fresh ginger to the oil heated over low heat. Use dry vegetables. Wet vegetables can ruin a stir fry by adding moisture that is not needed. Stir fry is cooked quickly over high heat, and the vegetable should still have some snap left in after they are cooked. The wetness of a freshly washed and not dry vegetable could run the risk of having a sloppy or mushy stir fry. Cook over medium high to high heat with a bit of oil. If vegetables are getting too dry splash a bit of water or broth into the pan to keep the vegetables from burning. Cooking over a high heat will also quickly cook the meat, preventing it from drying out. Do your prep work ahead of time. Stir fry cooks quickly, and it will not allow much time for prepping during the cooking process. Keep it moving and shaking. Continually stir, swish or toss your vegetables to ensure an even but not overcooked stir fry. Cut all vegetables to approximately the same size. This will help ensure even cooking. More dense vegetables such as broccoli and cauliflower may need a quick boil prior to stir frying, because they take longer to cook. Having a wok is not necessary. A high sided or deep skillet works just as well. Adding additional starches. If you choose to add a starch to your stir fry, such as noodles, do so at the end, right before adding a sauce and letting the stir fry warm through. Make a well. When making and thickening a sauce, push the stir fry to the middle of the pan and make a bare circle or well in the middle, add sauce to the well and allow to thicken before combining with the rest of the stir fry. Udon noodle and tofu can be added as well. Asian markets sell precooked and seasoned tofu if you prefer to take the guess work out. Frozen stir fry vegetables are surprisingly cheap and easy, and make creating a stir fry a cinch! Premade stir fry sauces can be found bottled or in packages that require the addition of water. Asian hot sauce is a must in this household, and a cheap way to add a little heat. Get creative in your choices or stick to what you know you like! Or Search Cook'n for a stir fry recipe. My favorite stir fry includes bell pepper, pineapple, onion and chicken. What are your favorite vegetables to use in stir fry?